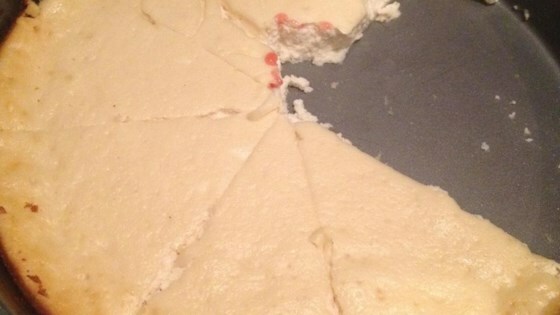 "You'll have a hard time believing this cheesecake could be both low-fat AND low-carb. It's light and creamy and absolutely delicious!" Preheat the oven to 325 degrees F (165 degrees C). Grease a 9 inch pie plate. In a medium bowl, mix together the cream cheese, ricotta cheese, sour cream and egg whites until smooth. Stir together the flour and sugar substitute; mix into the cheese batter along with vanilla. Pour into the prepared pie plate and smooth the top. Bake for 60 minutes in the preheated oven, or until the top is nicely browned. Cool completely before slicing and serving. See how to make a rich and creamy New York-style cheesecake. I used full fat EVERYTHING in the recipe, as I am only concerned about carbs-it was still almost unfit to eat.